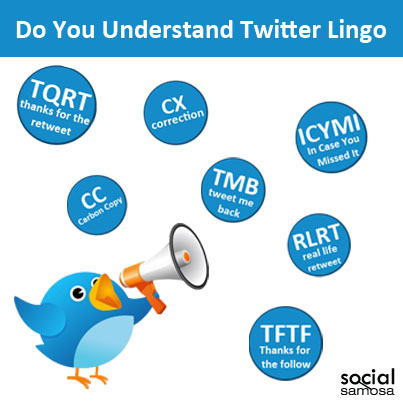 Do You Understand Twitter Lingo? Twitter is an entirely different universe. The rules are different, the idea is different, and the language used is also different. There is a place where you can say whatever you want using however many words you want, but that is elsewhere. On Twitter, you just have so many characters to use (140 including spaces, to be precise) to say everything you want. This has given rise to a new language, Twitter lingo, if you may, understanding which could be a little difficult if you are not in habit of using such words as HT (or H/T), MT, CX, etc., in your conversation. Don’t worry if the terms you just heard have confused you, because I will be telling you more about the Twitter lingo in this article. The caret sign (^) is used to denote that the tweet in question has been posted on behalf of a group (organization, team, etc.) by a user whose initial comes after the caret sign. For example, if I tweet on behalf of Social Samosa from its account, I can mention ^BKS at the end of the tweet to suggest who was posting it. Like the one you use in your mail, CC in twitter also means carbon copy. It is used like a mention (@) to attract a user’s attention. MT or MRT is used in retweets that have been modified by the person who is retweeting the tweet. This is done to indicate that although it is a retweet (RT), it has been modified. Most people modify tweets before retweeting it because of space constraints. HT is also written as H/T to indicate hat tip, a cultural expression of respect, recognition, gratitude, greeting, or simple salutation and acknowledgement done by removing one’s hat for a brief moment. It is more of a Western tradition, but with HT people have started acknowledging people’s effort on twitter (like sharing the content you are tweeting). It is a degree below TQRT (described below). If you want someone to answer you in as part of a twitter stream itself and not in direct message (DM) then you can ask the person to TMB, which means tweet me back. This is another form of retweet, but not a retweet of any particular tweet, but of something that the user heard in real life, that is why RLRT (real life retweet). CX stands for correction. It can be used to explain any kind of correction. If someone has retweeted your tweet, then it is basic courtesy to thank the user, and one way to do is to TQRT, which means thanks for the retweet. ICYMI stands for In Case You Missed It. It is often used by a user who is retweeting his own tweet from the earlier period, which he thinks people didn’t see earlier. This is also a way to bring your important tweets in front of your new followers. TFTF stands for Thanks for the follow, which you can use to show gratitude to someone who followed you on Twitter. Used particularly with people whom you never thought will follow you. The above acronyms are not the only ones you will find on Twitter. Twitter lingo comprises of many more symbols specific to particular industries, but I have concluded it here because my idea was to give you list of all-purpose symbols that anyone can use, regardless of the niche one is active in, and also to make the learning process a little less steep.